Amy Bockerstette is a Special Olympics golfer. Yesterday at the Waste Management Open, she melted the hearts of literally a million (and counting) who watched this video as she played with defending champ Gary Woodland and Matt Kuchar at the event’s famous par-3 16th hole. Watch it. Trust me, you’ll say “Someone must be cutting onions” as the eyes get leaky. Told ya. The joy is so honest and pure. I’ve already bookmarked it to cheer me up when needed. Woodland’s video pretty much captures the moment (starts at :55). Golf.com’s Josh Berhow reports on the heartwarming atmosphere. Amy meets Woodland on the par-3 16th tee at TPC Scottsdale during Tuesday’s practice round. She plays the hole with Woodland and Kuchar — “You can do this,” she told herself repeatedly — and ended up making par. Her tee shot found the bunker but she got up and down from a tricky spot, eventually draining her putt from about eight feet. But Bockerstette’s par on the 16th was no fluke. She qualified for the state tournament as a junior, and last year the Phoenix Sandra Day O’Connor student signed a letter of intent to play golf at Paradise Valley Community College. 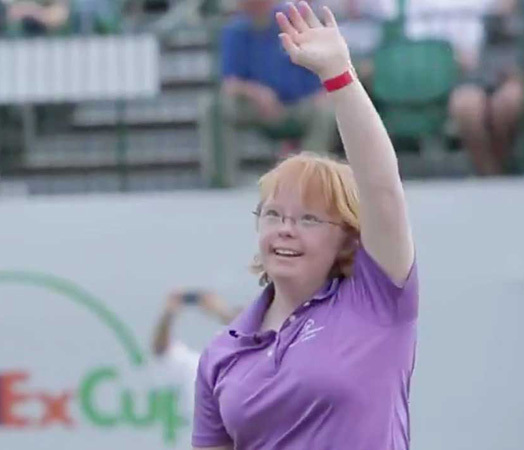 She’s the first golfer with Down syndrome to do either. After Amy met Woodland’s group on the back tees of the 16th, they walked up to the forward tee for her. The crowd waved and she waved back. “They love me,” she told her dad, Joe Bockerstette. As do we Amy. Thank you for making our day.